This item is interesting and clearly leads us to a great deal more physics using the ultra cold system. The theory also confirms that there is a lot of geometry at work here and my own ideas regarding the construction of atoms fits into this world. Better it provides an excellent confirmation tool for theoretical constructs that I contemplate ultimately producing through simulation. What is neat is to see a long ago theoretical result actually prove up in the lab. The math said so, but what theorist or empiricist ever really trust that? We are all too conscious that it is all made up although I sometimes wonder. All good and perhaps someone gets a Nobel Prize out of this. Because the Efimov state is weakly bound and is usually overpowered by other forces, observing it requires precise tuning. 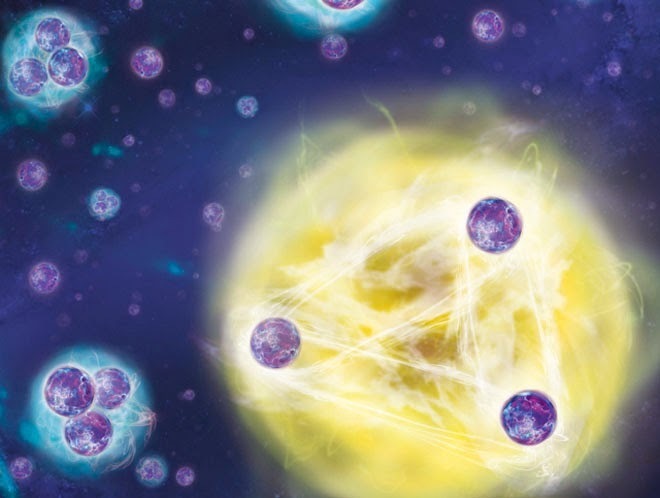 Particles must have the peculiar quantum property of being able to collide when they are far apart, beyond the range of the force between them–a situation analogous to Earth ricocheting off a distant star whose gravity it does not feel. And the particles must have too little energy to wiggle out of formation. A hundred years ago Nicola Tesla said the secret of the universe was in the three, six, and nine.